Why QEI? Because Confidence is Everything. QEI Security & Technology provides a one-stop solution combining quality brands and superior service in home security systems, 24/7 security monitoring and home automation. Our focus is residential security systems with home automation, however we also work with small businesses to provide low-voltage wiring, audio/video solutions and full home control systems that include entertainment, lighting control, climate control, security, smart door locks and programmable garage door control. 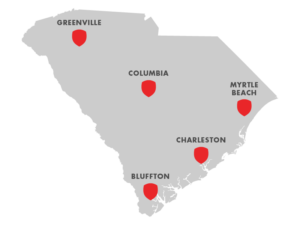 QEI Security & Technology has offices in five South Carolina cities: Charleston, Columbia, Bluffton, Greenville and Myrtle Beach. We also work hand-in-hand with many residential builders as the preferred security provider for their communities. You can be confident knowing our 24/7 security monitoring is handled by a TMA 5 Diamond Central station (one of less than 200 in the nation). Confidence is working with one of South Carolina’s largest security companies. QEI Security & Technology is headquartered in Charleston, South Carolina. With more than 25 employees and five offices, we are one of the largest South Carolina-based security companies. That means that you can feel good supporting a local business and knowing that your investment will stay right in your community. But, our size also enables us to offer the same discounts and deals as our regional and national competitors. A basic security system, plus installation and activation are ALWAYS free. It is truly the best of both worlds! Confidence is an experienced installation team. All QEI Security & Technology staff members are full-time employees – we do not use contractors. Our technicians are all Alarm.com and 2GIG certified, and have attended hours of training on the systems they are installing and servicing. The technician who installs your system is probably the person you will talk to if you have any future issues. Their passion is electronics and helping you to realize the full potential of your system – whether you’re just remotely arming and disarming your home security system or controlling all the devices in your home. Interested in the top trends or new ideas for using home automation? Our experienced technicians are always ready to help! Confidence is control at your fingertips. We want you to use your system to save time and money from the minute it is installed. That’s why we walk you through a full set-up of your control panel and free smartphone app. Together, we’ll customize the system to your lifestyle and make sure you know how to make changes yourself. Our home automation system is equipped with geographic location technology – so your system can react based on the location of your smartphone! You are also able to set “scenes,” which allows the automation of multiple devices with the touch of one button. Contact us to learn more about our home automation systems and security systems!